Second day of tour: DyCM shocked by choked drains, dilapidated school. 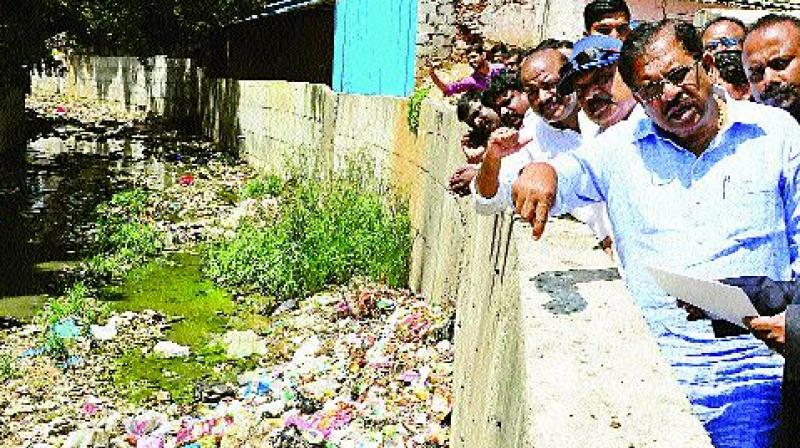 Bengaluru: Deputy Chief Minister Dr Parameshwar who has been inspecting the developmental works in the city was in for a shock when he went on to inspect Shivajinagar. A government school was in a dilapidated condition, stormwater drains were filled with filth and the leaky houses built for slum-dwellers all shocked the Deputy Chief Minister, and he gave an earful to the officials concerned, who were accompanying him. Mr Parameshwar first visited the Gurudwara at Ulsoor and was shocked when he saw a stormwater drain next to the Ulsoor lake filled with filth and garbage. He gave a 10-day ultimatum to clean up the drain. His next stop was the slum pockets of Yellamma Street and Munivenkatappa Colony. The residents complained that their houses leak during rains and demanded that they be rebuilt. Mr Parameshwar directed the officials of the slum board to build new houses for them. Later when he saw the condition of Government Urdu School at Shivajinagar he lost his cool and questioned officials as to why the school is not being developed by reserving funds from the BBMP budget, which is nearly Rs 10,000 crore. Mr Parameshwar who chaired a meeting of taxation and finance directed the officials to improve property tax collection. He suggested them to take measures to get all the pending dues of property taxes and asked officials to explore various options available, including slapping hefty fines on the offenders and convincing people to pay property tax.